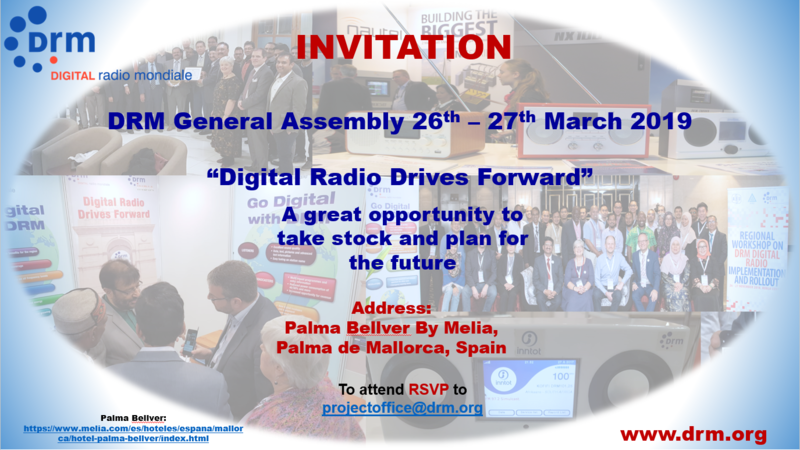 Digital Radio Mondiale’s 2019 General Assembly will take place March 26–27 at the Palma Bellver Bay Meliá Hotel in Mallorca, Spain. Under the theme “Digital Radio Mondiale Drives Forward,” the event will provide the opportunity for the consortium to review the past year and set the strategy and working plan for next year. It will also give DRM members and invited guests the chance to learn about recent DRM developments in countries such as India, China, Indonesia, Brazil, South Africa and Russia. Moreover, a full session on the March 27 will be devoted to receivers. Encompass Digital Media will broadcast BBC content from Woofferton transmitting station in the United Kingdom. Transmissions are slated for 12–13 p.m. UTC on 11780 kHz and at 3–4 p.m. UTC on 11790 kHz. Media Broadcast will conduct transmissions from Nauen, Germany during both days at 10–11 a.m. UTC on 13670 kHz. The broadcaster will air the program “The Mighty KBC,” which will include Journaline data. Red Telekom will carry out a DRM transmission test on March 20 at 2:30–3 p.m. on 15640 KHz. It will then on March 26 at 2:30–3:30 UTC it will broadcast on 15640 KHZ. “The General Assembly will be a moment to celebrate but also to refine the strategy in making the full DRM standard (whether in the AM or FM bands) recognized and accepted for the great benefits and extra services it can provide for all the needs of a country,” said DRM Chair, Ruxandra Obreja.